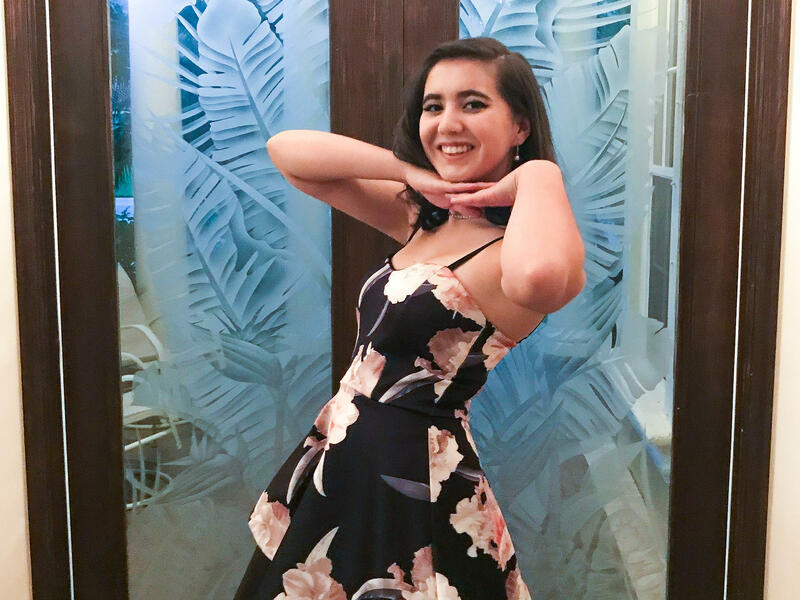 Carmen strikes a pose for her younger sister, Evelyn, before homecoming in the fall of 2017. Carmen Schentrup at age six. 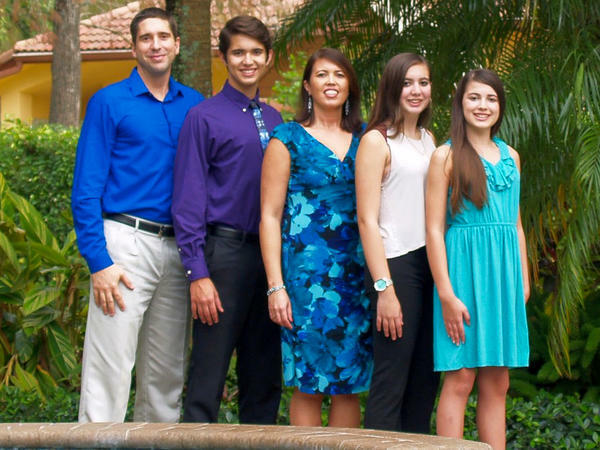 The Schentrup family in 2016: Philip, Robert, April, Carmen and Evelyn. Carmen was 15. The Schentrup family stands for a group portrait outside their home in Parkland, Fla., on Tuesday. 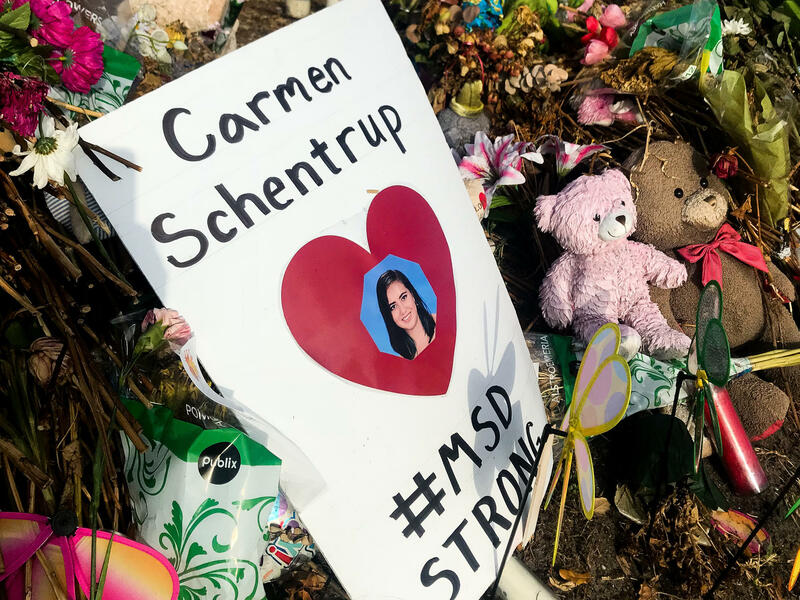 A makeshift shrine for Carmen Schentrup stands outside Marjory Stoneman Douglas High School. Hers is one of 17 shrines to the victims of the Parkland shooting. Though for the survivors and families of the 17 victims, it can seem like aeons. Carmen Schentrup was a high school senior, one week shy of her 17th birthday, when she was shot and killed in her AP psychology classroom. Her parents, Philip and April, speak with soft wonder as they share memories of their daughter, who showed she was gifted from an early age. "She learned how to read well before kindergarten," recalls April. Philip, a tech executive, remembers coming home one day when Carmen was about three to find her holding a book. "And I walk up to her and say, 'Hey, would you like daddy to help you read the book?' And she's like, 'No, I got it.'" Carmen skipped a grade early on, and her parents say she never lost her strong sense of self-determination. "She'd ask a million questions," her father says. "She was driven by a curiosity about the world, and her place in it." When Carmen decided she wanted to learn German, she taught herself. She took on pre-calculus in a six-week summer session. Her senior year in high school, she signed up for six Advanced Placement classes, even though her father suggested she lighten her load and have more fun. Carmen devoured books – so many that her older brother Robert bought her an e-reader to lighten her load. She especially adored the Harry Potter series, identifying with the brainy character Hermione. Carmen played guitar, violin and piano. "She would go online and find a song she loved and just practice until she did it," says her younger sister Evelyn, age 14. Robert, 18, a college freshman, highlights his sister's competitive streak. "She always wanted to be the one who came out on top when it came to academics," he says, "because I kind of had her beat in sports! She wanted to get into the best colleges she could." 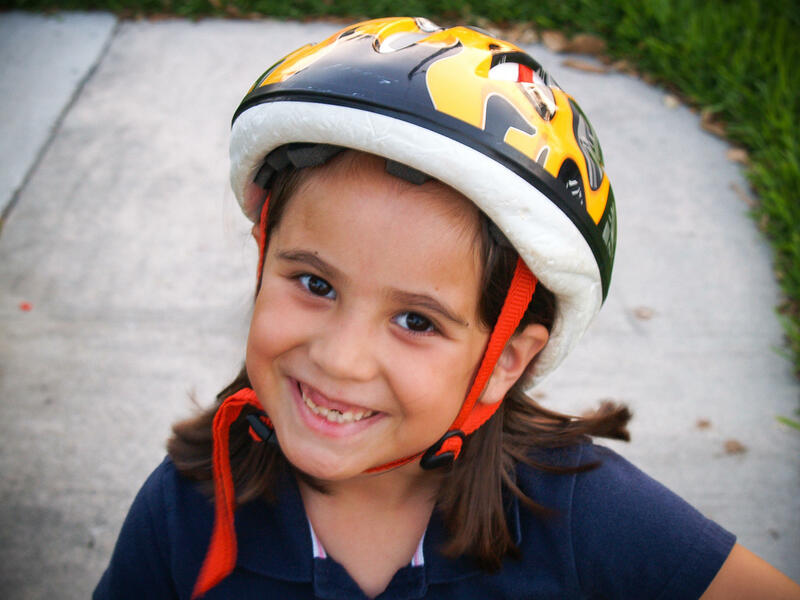 At the time she died, Carmen had been accepted into the University of Florida's honors program, with dreams of becoming a medical researcher. Up until now, the Schentrups haven't spoken to the media about the shooting. "We've always been private people," Phil explains. But they feel they can't stay silent any longer. "We become immune to tragedy," he says. "We guard ourselves from it, we don't want to think about it. We want to make it an academic debate, because then we don't have to feel the pain and suffering of others. We wanted to speak up." The family hopes that by their speaking out, others can better understand that suffering: its causes and consequences. The day of the Parkland shooting, April Schentrup was at the nearby elementary school where she is the principal. The first hint she got that something was wrong was when she received a baffling text message from daughter Evelyn. It said simply, "I'm safe." Very quickly, news started spreading that there had been a shooting at her daughters' high school. The relief that freshman Evelyn was okay, was followed by panic. April called Philip to say "Evelyn's safe, but I can't find Carmen." She recalls the family's frantic search for information: calling friends, sending out messages on social media, driving from hospital to hospital searching for Carmen. No one could tell them anything. "All I kept saying was, 'I just want to know where my daughter is,'" she says. At one hospital, April was told by law enforcement officials, "We want to be honest with you, this was a mass shooting and there were multiple fatalities." Her voice breaks as she continues: "I heard what they were saying, but I didn't want to hear what they were saying." Late in the night, she received a devastating phone call from the sister of one of Carmen's classmates. The conversation is etched in April's mind: "She said, 'I'm speaking for my sister, 'cause she can't speak. She saw your daughter get shot. And when rescue came, they didn't take her with them.'" It would be 12 excruciating hours before an FBI agent finally confirmed to the Schentrups that their daughter was among the 17 dead. "I think part of me just broke," April says, weeping as she recalls that moment. "And even as devastating as it was, I kept thinking, 'At least one of my children came home that day.' And it's sad to think that I'm thankful that one out of two of my children came home from school." As April breaks down, her children, Evelyn and Robert, lean in close, knitting their fingers around her hand. Ultimately, the Schentrups learned what happened in Carmen's classroom that day. The gunman shot out a window in the class door. He stuck the barrel of his semi-automatic, assault-style rifle through and fired, bullets flying everywhere. Carmen was struck four times. Her father Philip's voice shakes with anger and grief as he speaks of the aftermath. "People constantly say to me, 'I can't imagine what you're going through,'" he says. "Well you should. You should try to comprehend your daughter — who you are so proud of, and who was just beginning to live her life – being riddled by bullets. Being told, when the medical examiner gives the body back to the funeral home, 'You can't see her. We have to spend days working on her body. And maybe, maybe you'll be able to see her then.'" "Think about that," Philip urges. "And then come tell me why we can't do things to keep our kids safe." "It's unimaginable, but I think we need to imagine it," April says. "I know we need to act. We need to do something more than pray and console each other." With more urgency than ever before, the Schentrups support gun control measures such as banning the sale of assault-style weapons and high-capacity magazines. They want to see loopholes in background checks closed. They talk about their views with family members who are gun owners and NRA members, and admit that those conversations can be painful. After Carmen was killed, Philip recalls what he heard from a close relative: "'Sorry, but this is the way it is. This is our second amendment right.'" "Then I walk away," he says. "On the other hand," April adds, "we had another family member right when this incident happened tell me, 'We have this type of gun in our home, and we no longer want it.'" The Schentrups have little patience for the argument that it's the shooter that's the problem, not the weapon. "You can say it's the man – sure," Philip says. "But in the end, if we allow him to have the gun that can fire indiscriminately large amounts of bullets, that's on us. We let that happen." "Yes, whether you call him crazy or just evil, he's the guy who pulled the trigger. We put a gun in his hand, or allowed him to have a gun in his hand. So we have a part in it. We can fix it. We can change it. We have to want to." On March 24, the Schentrups will travel to Washington, D.C. for March for Our Lives, a protest calling for stricter gun regulation. They'll be joined by many other Parkland families, as well as clergy and members of their Episcopal church, St. Mary Magdalene of Coral Springs, Fla., where Carmen was a youth group leader. The Schentrups have never considered themselves activists; this will be the first time they've taken part in a protest. They'll be adding their voices to a chorus of demands that political leaders act to reform gun laws. "I see this as trying to make the world a better place for my kids who are still here," Philip says. As inspiration, the Schentrups give credit to the Parkland students who have created a nationwide movement around this issue. Their strength has become hers, April says. "It was hard in the beginning, and it's still hard," she says, her voice trembling, "because we miss [Carmen]. But missing her doesn't feel like enough any more." We're going to spend some time now with the family of one of the students killed in last month's shooting at a high school in Parkland, Fla. Altogether, 17 students and staff were killed. Carmen Schentrup was a senior one week away from her 17th birthday. Carmen's parents reached out to NPR to tell her story and to talk about the family's newfound activism. NPR's Melissa Block went to Parkland to listen. MELISSA BLOCK, BYLINE: It's been one month or an eon. Sometimes it's hard to tell which. PHILIP SCHENTRUP: You search for normalcy, a new normal. I say those words. I don't really know what they mean yet. BLOCK: Carmen's father, Philip, is driving to pick up his younger daughter, ninth-grader Evelyn, from the bus stop after school. Carmen used to drive her sister home. Today Evelyn's bus arrives late. There was a minor accident. EVELYN SCHENTRUP: So the bus - the driver was, like, crying and stuff. So they're like, she can't drive now. BLOCK: Another reminder of how raw emotions still are in Parkland. 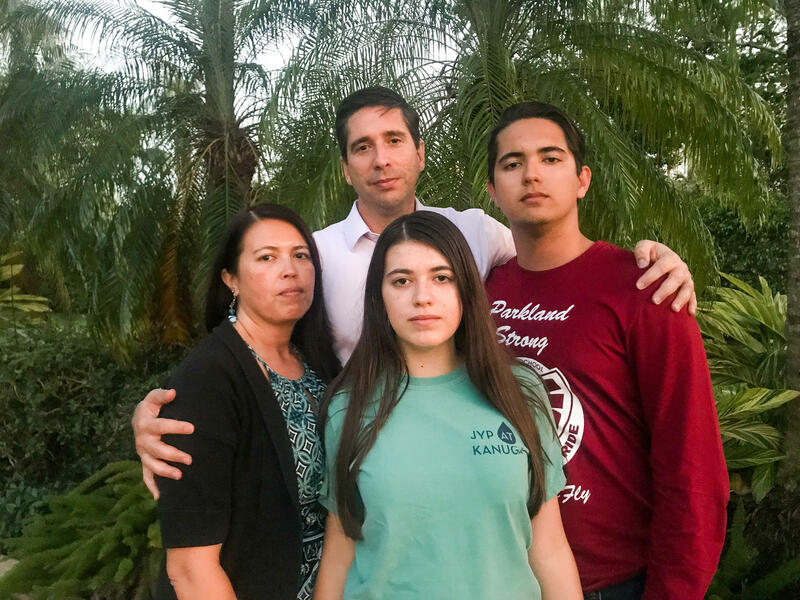 Back at their home, we sit down to talk - the parents, Philip and April Schentrup, and their children - Evelyn, who's 14, and 18-year-old Robert, a freshman in college. And they unspool vignettes about Carmen. APRIL SCHENTRUP: She learned how to read well before kindergarten. P. SCHENTRUP: She devoured books. ROBERT SCHENTRUP: And she loved Harry Potter. BLOCK: Carmen played guitar, violin and piano. EVELYN: She would go online, find a song she loved, and she would just practice until she did it. BLOCK: She was academically gifted, skipping an early grade, took six AP classes her senior year. She had dreams of being a medical researcher, was always asking questions. P. SCHENTRUP: She was driven by a curiosity of the world and her place in it. BLOCK: Philip Schentrup is a tech executive, April an elementary school principal. Before now they haven't spoken to the media about the shooting. But they feel they can't stay silent any longer. P. SCHENTRUP: We become immune to tragedy. We guard ourselves from it because then we don't have to feel the pain and suffering of others. And so we wanted to speak up. We wanted to speak out. BLOCK: Try to imagine learning there's been a mass shooting at your children's school. Imagine hearing from one daughter that she is safe, but from your older daughter you hear nothing. You race from hospital to hospital, searching and hoping. You get no answers. It'll be 12 excruciating hours before an FBI agent tells you your daughter is among the dead. A. SCHENTRUP: I think part of me just broke. And even as devastating as it was, I kept thinking, at least one of my children came home that day. And it's sad to think that I'm thankful that one out of two of my children came home from school. BLOCK: Evelyn and Robert lean in close to their mother, knitting their fingers around her hand. Ultimately, the Schentrups learned what happened in Carmen's classroom that day. The gunman shot out a window in the class door, stuck the barrel of his semi-automatic assault-style rifle through and fired, bullets flying everywhere. Carmen was struck four times. P. SCHENTRUP: People constantly say to me, I can't imagine what you're going through. Well, you should. You should try to comprehend your daughter, who you are so proud of and who was just beginning to live her life, being riddled by bullets. Being told when the medical examiner gives the body back to the funeral home, you can't see her. We have to spend days working on her body. And maybe, maybe you'll be able to see her then. Think about that and then come tell me why we can't do things to keep our kids safe. A. SCHENTRUP: It is unimaginable. But I think we need to imagine it. I know we need to act. We need to do something more than pray and console each other. BLOCK: The Schentrups support gun control measures like banning the sale of assault-style weapons and high-capacity magazines with more urgency than ever before. They talk about their views with family members who are gun owners and NRA members, and those conversations can be painful. After Carmen was killed, Philip heard this from a close relative. P. SCHENTRUP: Sorry, but this is the way it is. This is our Second Amendment right. And then I walk away. A. SCHENTRUP: On the other hand, we had another family member right when this incident happened tell me, we have this type of gun in our home and we no longer want it. BLOCK: And the Schentrups have little patience for the argument that it's the shooter that's the problem, not the weapon. P. SCHENTRUP: If we allow him to have the gun that can fire indiscriminately large amounts of bullets, that's on us. We let that happen. Whether you call him crazy or just evil, he's the guy who pulled the trigger. We put a gun in his hand. We have a part in it. We can fix it. BLOCK: So on March 24, the Schentrups will travel to Washington, D.C., for the protest called the March for Our Lives. They've never taken part in a protest before, but they're inspired by the Parkland students who've created a nationwide movement around reforming gun laws. Their strength, April says, has become hers. A. SCHENTRUP: It was hard in the beginning. And it's still hard because we miss her. But missing her doesn't feel like enough anymore. BLOCK: Melissa Block, NPR News, Parkland, Fla.
(SOUNDBITE OF HOLLAND SONG, "COLD SPECKS") Transcript provided by NPR, Copyright NPR.